The BACtrack turns your phone into an accurate breathalyzer, eliminating any doubt as to whether it's a good idea to get behind the wheel. You good to drive? Unfortunately the answer to that question isn’t always the right one, and if a cop has to answer it for you it’s a good bet they’ll be getting the truth. One of the reasons is that they can actually see how much you’ve had to drink by measuring it in your breath. 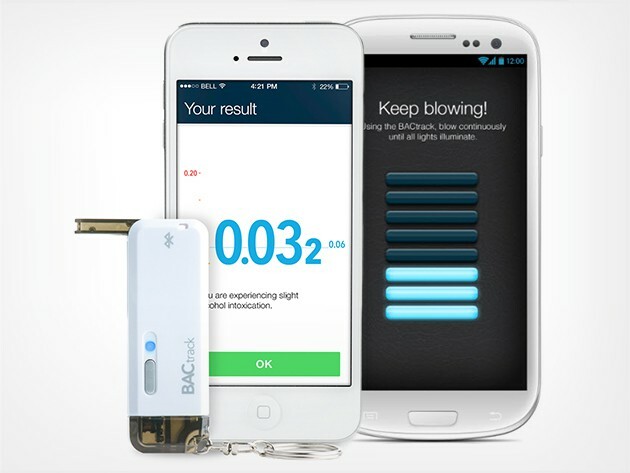 Of course nobody should hop in a car after drinking any amount, but with the BACtrack Vio Smartphone Breathalyzer, you can take the role of cop before one rolls up on you or your friends if there’s any question. It’s a disaster averting tool that you can get for just $39.99 at Cult of Mac Deals. The BACtrack Vio is small enough to fit in your pocket or be used as a keychain, and connects via Bluetooth to the included app. After five seconds of breathing, ZeroLine technology and MicroCheck sensors ensure an accurate blood alcohol level reading. Plus, for a little fun, there’s a ‘guess your blood alcohol level’ feature built in, could make for a fun drinking game on its own. Eliminate any doubt about whether driving is an option with the BACtrack, for just $39.99.